This post is primarily for the benefit of the students currently in my Character Design class in the Sheridan College BAA Animation programme. An ongoing assignment that they've been working on throughout this fall semester involves drawing a number of people from life or from video (but NOT from still photos! 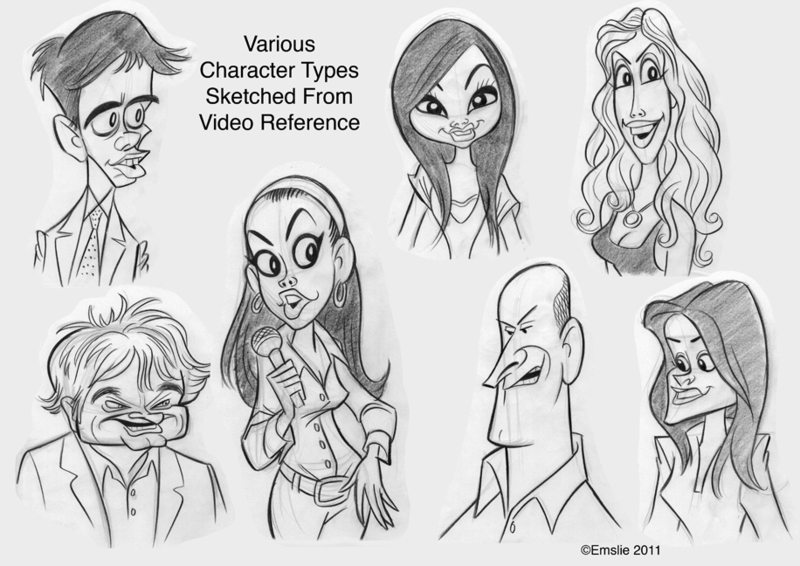 ), as a way of building up a reference library of "Character Types", that ideally they should then refer back to when trying to create new characters for animation or other assignments. I'm a great believer in creating a character design that communicates something about the character to the viewer through the visual appearance alone, even before they start to move or speak in the animation. 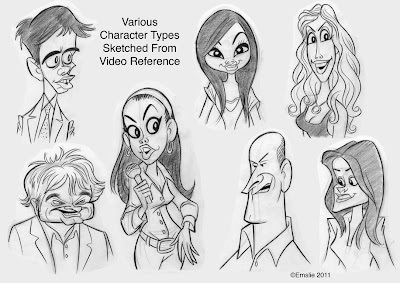 Just as the Casting Director in a live-action film tries to cast an actor who looks credible for the role, so too does a Character Designer strive to "cast" the right sort of type for an animated character, giving much consideration to how the physical aspects of the design will suggest a certain personality type that the viewer will recognize. 1) What is the basic head shape? Is it long or short? Round, blocky, or triangular? Wider at the top, middle or bottom? 2) Is the facial plane straight up and down, convex or concave, or angled forward or back? 3) What is the relative placement of the facial features within that head shape? Are they mostly in the lower area with a high forehead? Are they converging toward the middle or stretched vertically along the facial plane? 4) Where are the features relative to each other? Are the eyes wide apart or close-set? Is the bottom of the nose not far from the eyes or pushed down closer to the mouth? 5) What is the relative size of the features to each other? Large or small eyes? Long or short nose? Wide or narrow mouth? 6) And finally, what are the specific shapes of the features? Are the eyes angled up or down, narrow slits or wide with much white space around the pupil? Is the nose "Pug", "Ski-slope", or "Roman"? Thick or thin lips, etc. etc. etc.....? Study the Character Type samples I have posted here and try to analyze them using these and other questions to determine what makes the head shape and features distinct and unique! Terrific insights as always Pete, thank you! I have been following JohnK's blog to help my self-studies. Good stuff here, thanks for the post! Hi I think your artwork is terrific. Great advice. Could you at some point cover body types and their constructions. I find it difficult to make the bodies cartoony yet beleivable. This is great advice! Thanks, Pete!